I must apologise, in advance, for this recipe. This is definitely a treat for a long run day. This recipe is adapted from a BBC Good Food recipe called Best-ever Brownies. I have made this recipe so many times and it is my trusty go-to if I am suddenly expecting guests or if the family are coming round. Although it sounds a little fussy when you read through the method, it is so simple and the recipe is easy to remember so you can just throw it together anytime, anywhere!!! This adaptation uses Toblerone, so if you have any left-over from Christmas or from your airport ‘using up the euros’ purchase that will be ideal. Actually you can substitute the Toblerone for any surplus chocolate that you just happen to have lying around! WARNING: only make this if you have at least 5 other people to share it with otherwise you will blow your calories for the week! 1. In a medium bowl add the butter and the dark chocolate and 85g of the Toblerone. You need to melt these together so you can do it on the hob over a saucepan of water or you can microwave. Stir well and leave to cool. 2. Into a separate bowl sieve together the flour and the cocoa powder. 3. Chop the remaining 100g Toblerone into cm sized chunks (resist the temptation to eat any). 4. In a large bowl or a food mixer whisk together the eggs and sugar until thick and creamy – for about 5 minutes or more if you are using a hand whisk. 5. Put the oven on to 160ºC fan/180ºC conventional/Gas 4. Prepare a square brownie tin with greaseproof or parchment paper in the base. 6. Fold in the cooled chocolate mixture into the eggy mixture and stir in gently until it is all mixed. Re-sieve the flour mix into the bowl and stir in gently until completely incorporated. Add the chunks of Toblerone and give another stir until evenly mixed. 7. Pour mixture into prepared tin and make sure it spreads into the corners, level off the top. 8. Bake for 25 minutes. If you want a really gooey dessert suitable to eat straight away with vanilla ice cream – remove from oven now. If you want brownies that are still slightly gooey but you are eating after they have cooled, cook for another 5 minutes. 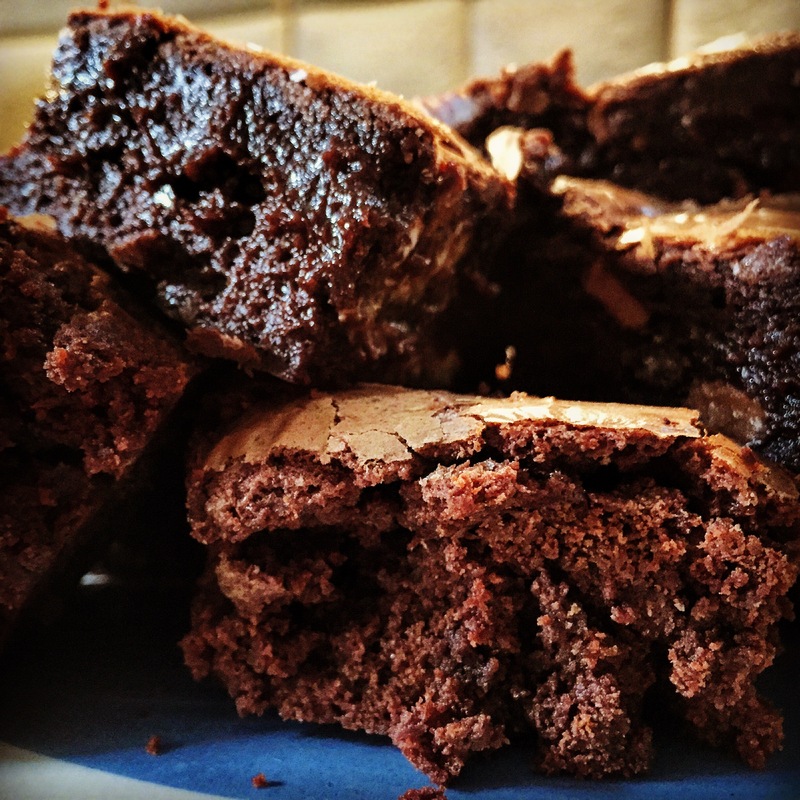 If you want brownies that aren’t really gooey but still yummy, leave for a total of 35 mins. You can adjust this to suit. I’d love to hear how yours turned out and whether you shared!